Signage has several purposes. 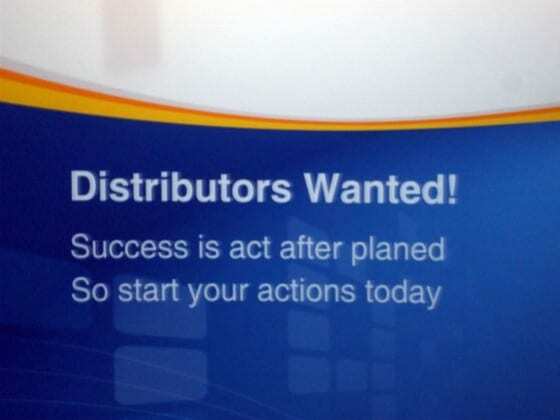 It provides information, gives direction and promotes businesses. When your signage is well-designed, properly installed and in good condition it is an asset to your business. 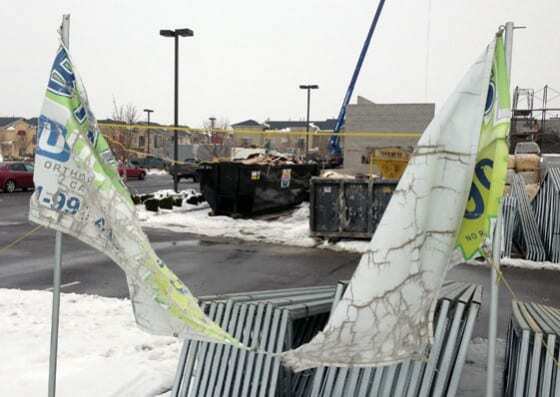 But when those elements aren’t in place, your signage can do more harm than good. One of the main purposes of signage (especially signage that advertises sales and special events) is to draw people in and make them want to buy your stuff. Unfortunate wording can have the opposite effect. 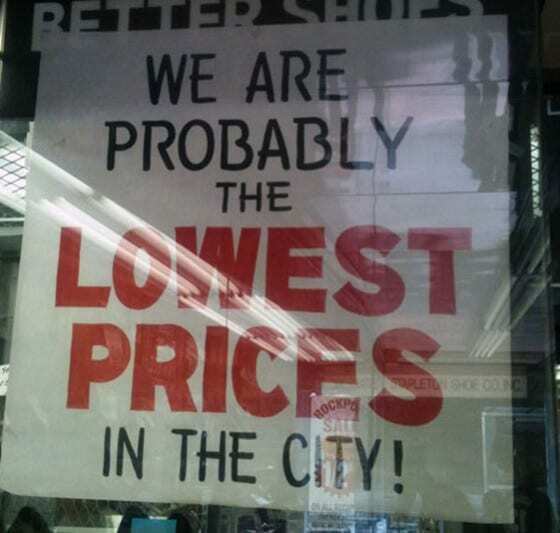 This sign in the window of a New York City shoe store doesn’t inspire confidence; it makes me want to go out and comparison shop. Probably? If you can’t state something with complete certainty, it shouldn’t be on your sign. What kind of service and quality could I expect from this store? Well… maybe it would be really good. And maybe not. Poor grammar probably doesn’t bother everyone, but it definitely bothers me; the grammar on this sign makes me wince every time I drive by. 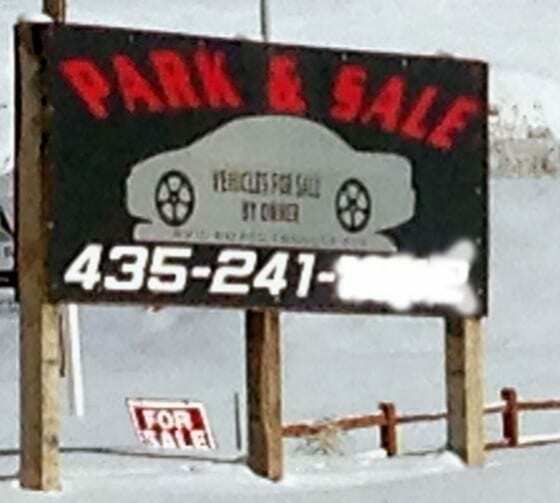 The verb “Park” should be joined by another verb: “Sell.” I won’t go into an entire grammar lesson here; either you get it or you don’t. If you don’t, then you probably want to get a second opinion next time you’re trying to come up with wording for your sign. The creator of this sign was probably counting on Google Translate to provide the correct words in English. A tactic that obviously didn’t work. Holiday signage is a great way to add a festive touch to the exterior of your shop. But when the holiday is over, the signage should come down. Immediately. Signage isn’t meant to be a “set it and forget it” part of your store. It needs occasional repair. 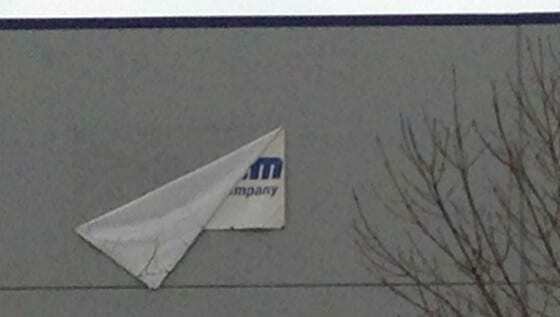 When signs are damaged, they should be fixed promptly. Hopefully this restaurant is a little more fussy with its food quality than it is with its signage quality. 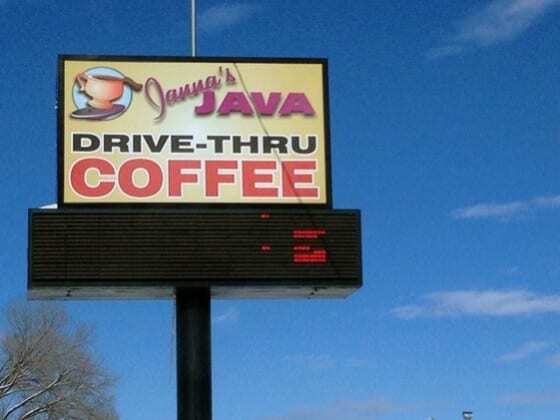 Digital signs go on the fritz every so often. If yours is frozen or otherwise not displaying properly, turn it off and call the sign company to fix it. The recession has hit hard in my town and many businesses along Main Street have closed. How can you tell when a business is shut down? The message marquees on its sign is blank. But what if you’re still open for business? Well, if you have a marquee on your sign, it should say something. Anything. 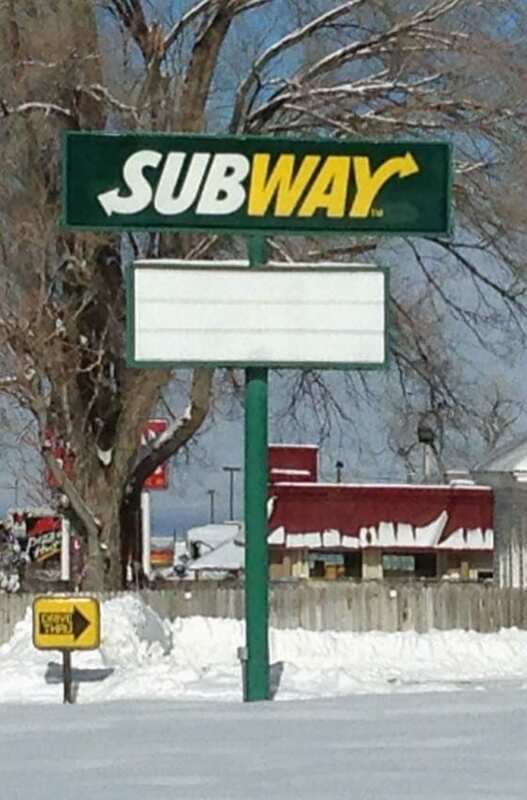 If it’s blank, people might think you’ve closed for good. Both of these businesses typically have messages up on their marquees. So when I drove past them recently and saw that they were blank, I immediately wondered if they had closed down. Nope. The businesses are both still open; they’ve just neglected their signs. 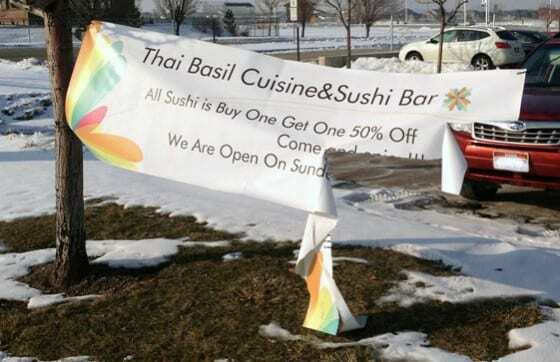 Not only are these signs not being as effective as they could be if they were advertising specials; they’re actually doing harm by causing potential customers to wonder if the business is closed. You’re broke. Why else would you leave up a raggedy sign? You’re blind. Can’t you see that your sign is faded and has holes in it? These signs were probably provided by the manufacturer of the car wash product. A quick phone call might result in some free replacements. You’re out of business. This sign for an orthodontist is so old and ruined that I thought the guy had gone bankrupt. Nope… his office is still there and the lights are on. Perhaps you weren’t as thorough with your sign installation as you should have been. 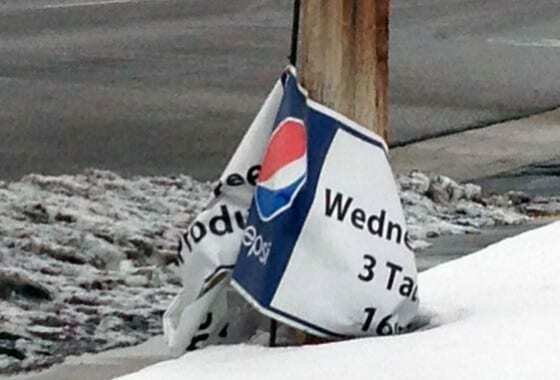 Or maybe yesterday was really windy and one corner of your sign came loose. 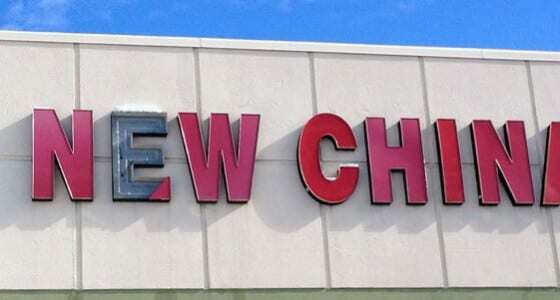 It doesn’t really matter why your sign came undone… it just matters how quickly you fix it. If you leave it like this, no one can read your message. This business is… well, we don’t know. Because we don’t even know what this business is. Because the sign is all folded over so we can’t read a darn thing on it. Is this business legitimate? Customers want to do business with companies that look like they’ve either been around for awhile, or will be. It’s ok if your business is new, but you should project confidence and security. 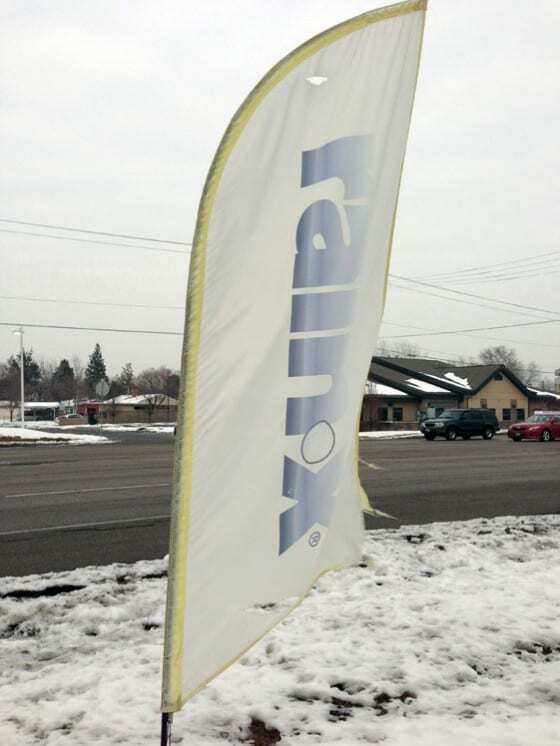 If you just slap up a couple saggy banners on the front lawn, your business will have a temporary feel. Instead, properly install your temporary banners above your doorway. Make sure that your yard signs are kept in good condition. Your signs should never give customers the impression that you’re headed for bankruptcy… or already closed. Is the business owner organized and professional? Customers don’t want to deal with haphazard, disorganized businesses—they have better ways to spend their time than babysitting the people who are supposed to be helping fulfill their needs. If you haven’t removed Christmas signage yet, now’s the time (well, the time was actually four weeks ago, but better late than even later). Your signage provides the first impression of your business to potential customers. Make sure it’s working for you… not against you.